Afocal systems, by definition, produce a virtual image projected from infinity (i.e., the output beam is collimated). Examples include visual optical devices such as binoculars and riflescopes, and afocal adapters that increase the focal length of camera lenses. To perform a modulation transfer function (MTF) measurement on an afocal system, the collimated image must be focused to form a real image. Because an afocal lens forms a virtual image, an auxiliary “decollimating” lens must be used in conjunction with the afocal lens in order to form a real image which may be sampled by an appropriate image analyzer. Figure 1 – Decollimating lens focusing light from an afocal system. The decollimating lens is an essential component in the test setup, and must be selected so as not to adversely contribute to the measured MTF. In other words, the performance of the decollimating lens must be diffraction limited in the context in which it is used. One of the key aspects to achieving this is to ensure that the decollimating lens is always used in an on-axis configuration. This, in turn, implies that the axis of the decollimating lens and the image analyzer must follow the direction of the chief or principal ray when making off-axis measurements of the afocal unit under test (UUT). This leads to the need for a second rotary axis – one rotation (blue components) sets the object field angle while the second rotation (green components) aligns the image analyzer and decollimating lens to the output chief ray (Figure 2). The angles are known through the magnification of the telescope; . To measure the MTF on an OpTest bench the AF-1100 Afocal Adapter is used. 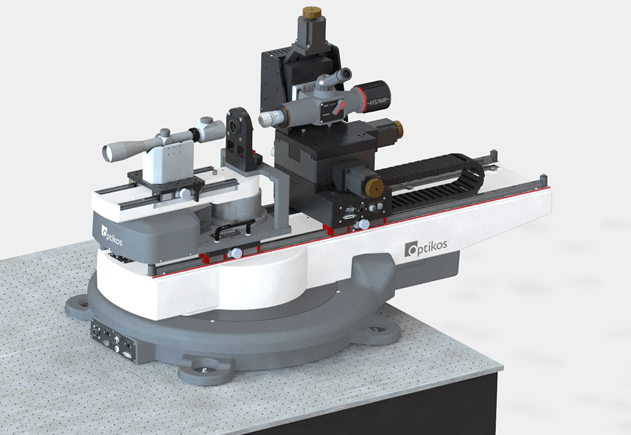 (Figure 3) This system is designed to mount on an OpTest LP-1000 rotary platform and provide a second rotary axis for proper geometrical configuration for the measurement. Figure 3 – The AF-1100 Afocal Accessory set up on the LP-1000 platform. In visual optical instruments the system stop is the pupil of the user’s eye. Testing of these instruments requires the placement of a physical aperture of a certain diameter at the exit pupil location. The AF-1100 includes a bridge arrangement that places a set of kinematic features in a fixed location with respect to the AF-1100 axis. Users may design their own fixtures that interface to these features to place apertures and decollimating lenses on the axis, or they may use the fixture provided with the AF-1100 to do the same. Most afocal systems (telescopes, riflescopes, and binoculars) are designed for use with the human eye. Therefore, they should be tested with an aperture that approximates the diameter of the pupil in the human eye. The decollimating lens supplied with the AF-1100 is chosen such that it is diffraction-limited when used with an aperture that approximates the diameter of the pupil in the human eye. 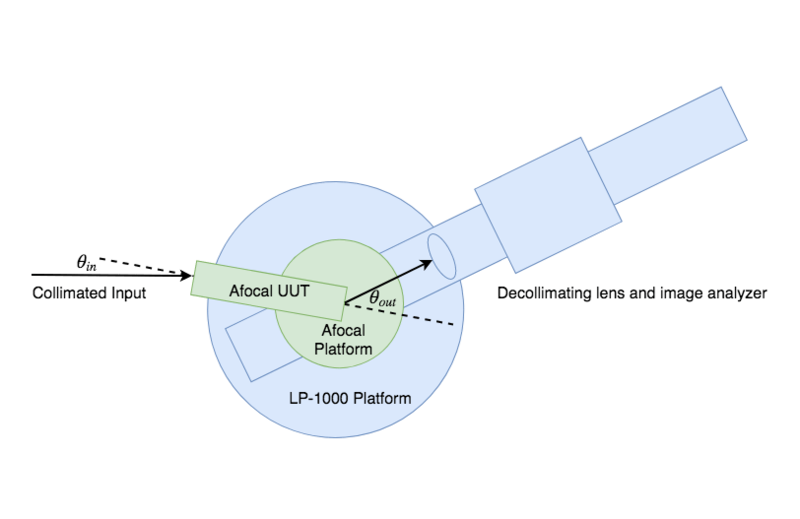 The focal length of the decollimating lens is used to scale the measured MTF from the image plane of the decollimating lens (lp/mm) to the image space of the afocal system (lp/mrad or cyc/mrad). Because the decollimating lens is diffraction-limited, it has no effect on the measured result from the afocal system. Any measured departure from a diffraction-limited MTF is solely due to image degradation from the afocal system being tested. More information on Optikos MTF testing products is available here: https://www.optikos.com/metrology/.